Hormel Foods recently launched a new addition to its Compleats product line, Hormel Compleats® for Kids. This new product offers four different varieties of complete meals that are convenient and ready to eat for kids three-years old to eight-years old. Because these Compleat meals use Hormel’s shelf-stable technology, these products do not need to be frozen or refrigerated. Less than a minute in the microwave oven is all it needs to be ready to eat. Not only are these Compleat meals convenient, they are also delicious and nutritious. Each serving contains three grams of fiber and lots of protein. This new product does not contain any preservative, trans fat, corn syrup (which is high in fructose), or artificial colors. This product has also passed USDA’s regulations for healthy foods. According to Tim Garry, product manager for Hormel Compleats® Kids, the company is excited to introduce this new product to the market because of its convenience. 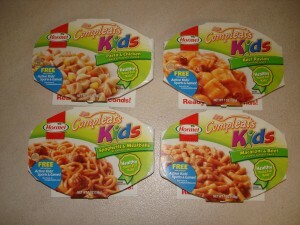 Compleats microwaveable meals for kids easily fit into every family’s busy everyday life. Another great thing aside from its convenience, is that kids actually enjoy eating them. Garry added that the microwaveable meals are ready to be served after being popped in the microwave oven for just forty-five seconds. Varieties of this microwaveable meals are Spaghetti and Meatballs, Macaroni and Beef, Pasta and Chicken and Beef Ravioli. Hormel Compleats® microwaveable meals for kids are now available in grocery stores in different parts of the country. All four varieties of these microwaveable meals are sold at a suggested price of $2.29. I’m eating a bag? of gummy bears right now…..and I just ate a green one! This is the type of song that is so annoying its good.